I love wines made from the Merlot grapes, and this was absolutely no exception. My cousin had this wine waiting for me, and it was the first of a few bottles of merlots enjoyed the last part of the trip. 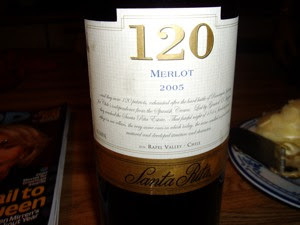 120 Merlot 2005, Santa Rita - Chile, is produced at the Santa Rita vineyards, that has produced wines since 1880. This wine is one of a whole range of 120 wines, made from different grap varieties. The name of the wine goes back to the events of the Chilean war of independence in 1814. You can read the fascinating story here. It was beautifully soft and fruity, with the soft taste of oak, that I love so much. Perfect to red meat, or well temperated by the fire. Thank you. You can give me encouragement by visiting the blog on and off!